Battery longevity is a consideration for many hybrid car buyers. When new car buyers consider purchasing a Toyota Prius, battery replacement tops the list of possible concerns. How long will the battery last? How expensive is it to replace the battery pack? Before you buy a Toyota Prius, it's important to get clear answers to these and other battery-related questions. When it comes to buying a new vehicle, whether it is a hybrid car or has a traditional gasoline engine, that knowledge brings peace of mind. Introduced in the United States in 2001, the Toyota Prius has gone on to become one of the most popular vehicles among U.S. car buyers. In fact, of the 1.2 million Prius vehicles sold in 2009, over half of those were sold to U.S. consumers. 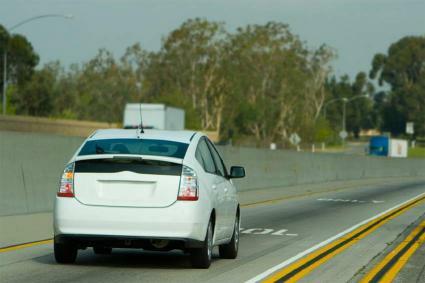 According to the EPA, the Prius is also one of the cleanest cars available for sale in the U.S.
A large part of the vehicle's energy efficiency comes from the use of a nickel-metal hydride (NiMH) battery pack to assist the traditional gasoline engine. The Prius stores power in the battery pack and then uses that energy to operate the vehicle when the gasoline engine is not required. This is typically when the car is going at slow speeds or is stopped. Since the car is not using as much gasoline when the battery is in use, the overall fuel consumption of the vehicle is greatly reduced. The Toyota Prius comes with a battery warranty of eight years or 100,000 miles in most U.S. states. In California and seven other states, the warranty is even more extensive: ten years or 150,000 miles. If the battery pack fails while it is still under warranty, Prius owners are entitled to a replacement battery from the manufacturer. Because U.S. car buyers have been purchasing the Prius since 2001, there is a significant amount of data available to show that the Prius battery pack seems to last for several years and many thousand miles. Some owners are reporting as many as 300,000 to 400,000 miles on the original battery pack. Reports of 200,000 miles are common. Despite these reports of long battery life, many Prius owners may need to replace the battery pack sometime during the life of the vehicle. Chances are, if you own your Prius long enough, this is a repair you will eventually encounter. When the battery packs can no longer store power, owners will need to pay between $2,299 and $2,588 for the replacement battery pack. Labor will be an additional charge, which will vary with the dealer or service professional. Toyota is committed to recycling the batteries used in the Prius. Dealers are paid $200 for each battery to encourage recycling, and the battery itself is marked with a phone number for information about the recycling program. When it is recycled, the battery's various components are broken down and reused. Toyota prides itself on recycling every part of the Prius battery. Just like any other vehicle on the market, the Prius also has an accessory battery. This 12-volt battery is used to power the vehicle's computers, radio, fans, lights, and other accessories. This battery has a typical lifespan of about five years and has a replacement cost of between $150 and $300. For many potential hybrid owners, Prius battery replacement remains only a minor concern. In general, the Prius is slightly more expensive to repair than a typical vehicle, but it is also more economical to operate. This gives it a lower ownership cost than many other vehicles. If you're considering purchasing a Toyota Prius, keep in mind that you may need to replace the battery sometime during the life of the car. However, the extensive battery warranty and impressive reliability record indicate that this repair is not something you'll likely need to worry about for several years.